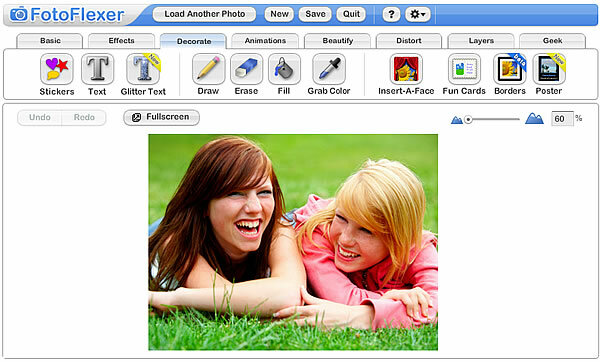 Fotoflexer is a powerful online photo editing software. It can be considered the first picnik’s opponent in the web. But Let’s start From the Beginning. FotoFlexer is a free online photo editing software, that give to you the chance to edit your photos, by simply uploading them from your Hard Drive. Pictures, Photos and Images, are placed in a virtual canvas, where is possible to edit, optimize, adding effects to your photo. 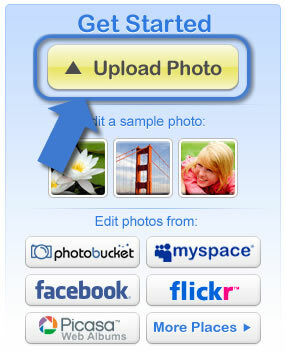 When you finished to edit your images, you can share it using Facebook, Flickr, Picasa, Myspace e Photobucket. Let’s take a look, how to edit and enhance your photo using FotoFlexer. The first thing to do, obviously, is to acces to the Fotoflexer Home Page. On the right side of the screen you can see the button to upload a photo. Just click on it, browse through your Hard Drive files and select the one you want to be uploaded in Fotoflexer appliction. You can edit Photos from, Photobuket,Â Myspace, Picasa and flickr too or use a sample photo, just to test Fotoflexer capabilities. Once uploaded, your photo will appear in Fotoflexer working area, and all is ready to begin to edit your first photo, using Fotoflexer. 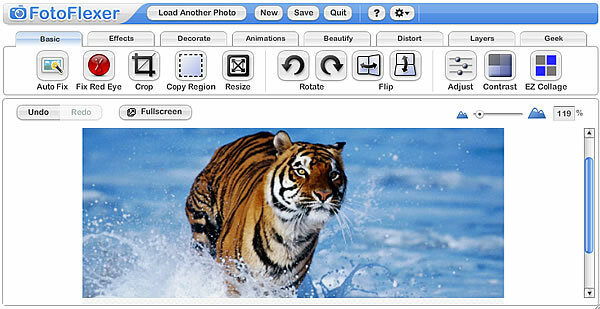 Now, The photo i has been loaded in Fotoflexer, before starting to edit it, let’s take a look to fotoflexer user interface. 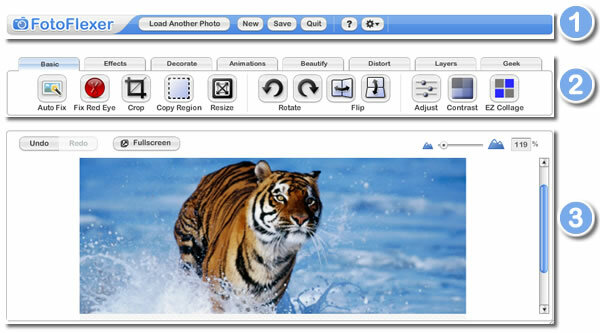 Fotoflexer‘s user interface it is very simple to use. At the top of the screen,Â you can see white buttons, used to upload new photos, save, or quit Fotoflexer. Just below the white buttos there are the categories where all Fotoflexer effects and filters are divided. Categories of Fotoflexer Effectes and buttons to activate them. Main Fotoflexer Working Area, where all effects can be seen applyed to the photos, scrolling up and down, Zoom and Undo commands. Red Eye Removal can be performed clicking the button Fix Red Eye. The Fix is very easy to do, once clicked on the button to activate the effect, just click on the center of the eye, just near to eye pupil. The software will automatically fix the red eye, giving to the eye a natural color. As you can see, the right Eye has been fixed, just with a mouse click. This tool is very useful to save old photos that you can’t use because the eye defect. To apply the Fix, press Done. Your Red Eye Fix will be saved in your photo, and you can proceed to appy photo effects and filters. Red Eye Removal Tool is a Basic Retouching tools, so you can find it very easily once uploaded a photo. FotoFlexer has a huge number of Photo filters and Effects. With fotoflexer you can change the colors of your photos, and give an amazing final touch to your photos too. You can find in FotoFlexer 32 different kind of effects and filters. In the picture below, you can see a preview of all 32 FotoFlexer Photo effects and Filters. Here’s the effects you can find in FotoFlexer Software. Every image represents a little preview of the effect once applied to a photo. I have tried all this effects. I made a little list of my best one filters. Let’s see it. Patchwork The Photo will be transformed in a Patchwork style Picture. Duotone This is a very interesting effect, do you know the Gray scale effect? This effect allows to choose 2 colors and using them, creating a sort of Gray scale effect. All colors in the photos are changed use only the two colors you choose. All Fotoflexer‘s effects and filters are immediately applied to your photo. You can change the option of the effectss using “Advanced Options” Button. The most interesting feature of Fotoflexer software can be found in Beautify Menu. In this Menu, you can find all you need to Make up yourself, Fix Blemishes and Smooth wrinkles. This feature in Google’s PicnicÂ is a PRO feaure, that’s mean that you must pay to use it. 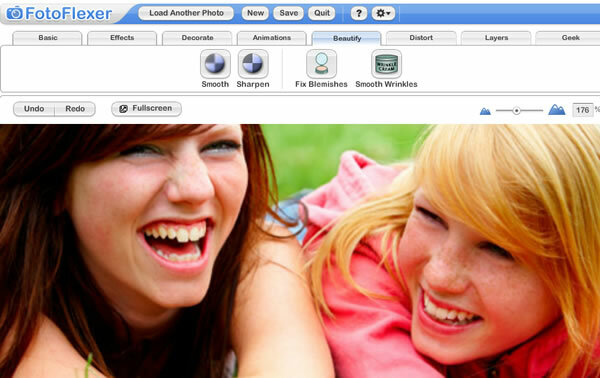 In Fotoflexer, you can use this feature completely free. Another interesting Fotoflexer Feature can be found in Decorate Menu. here you can find all you need to decorate your photos, and other nice features like Insert-A-Face, that allows you to put your face in a picuture. Fun Cards: Creates Fun Cards, with your face, text etc. Posters: Transform your photos in a “motivational” or “demotivational” poster. Add the text and you’re done! Long story short, FotoFlexer is surely a very good and easy to use, online photo editing software to edit photos and pictures. The potential of this software does not end here. FotoFlexer has many functions, which I invite you to find out by going to the official home page of the site. I Hope this post will be usefull and donâ€™t forget to share this article with your friends in Facebook, Google + and Twitter! Translated from the original Sito per modificare foto.